Beat cream cheese, Nutella and powdered sugar until fully blended Set aside. Using a whisk attachment and another bowl, beat heavy cream and vanilla until stiff peaks form. Fold whipped cream in to cream cheese Nutella mixture, lightly, but until evenly combined. 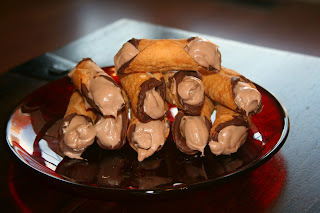 Using a pastry or piping bag, fill each Cannoli shell, and garnish as desired. * if you want chocolate on the ends of the shells, make sure to dip in melted chocolate, and dry, before filling the cannoli with filling. These sound fantastic and I love the new name and design!